Win a FREE Program & Equipment Each Week! 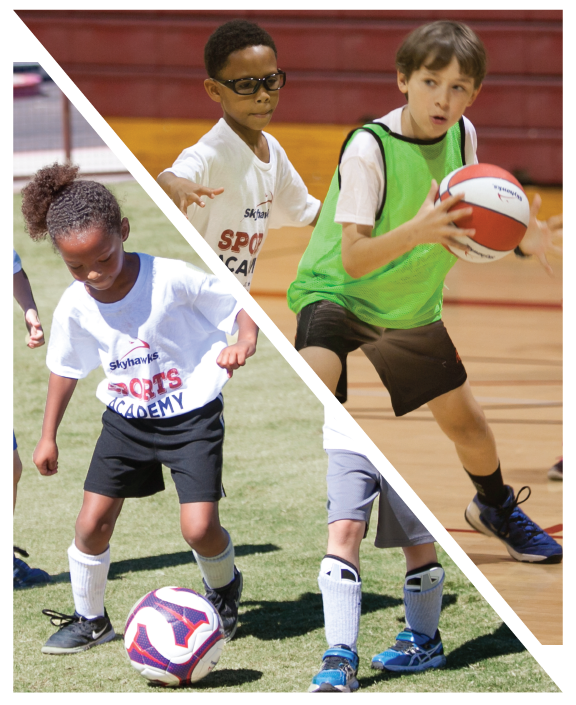 This summer, Skyhawks will be giving away a FREE Skyhawks program and sports pacakge each week! Tag Skyhawks in a photo on Instagram, Facebook, or Twitter with #Skyhawks2017 to enter - that’s it! Enter as many times as you like, but only one entry will be recorded for each picture. Winners and weekly prizes will be announced at the beginning of each week on Skyhawks’ social media, so follow us to see what’s up for grab and who won! The first prizes will be announced on TOMORROW, JUNE 27th! Start sharing and enter to win! The following is a guest post written by Jacob FIll, returning Skyhawks coach in San Jose, CA. My birthday is coming up this summer. I’d say I’m pretty lucky to have a summer birthday, especially as a college student. One of the great things about a summer birthday for me is that I get to spend it with my family. One of the bad things about spending it with my family is that my mother, every year, forces me to look through her old scrapbooks of my childhood. Every year we sit down, against my will, and look through some embarrassing pictures of me as a child, but every year I take an extra long look at one picture in particular; it’s a picture of me as a toddler, being held up by my father to dunk on a plastic Fischer-Price basketball hoop. This picture in particular is special to me because it symbolizes my love for sports. I have played sports my entire life, both at a highly competitive level and at a recreational level in college. Once I realized my basketball playing days would be over after high school, my initial thought was, “How can I continue participating in sports without playing at the college level?” I quickly realized coaching was what I wanted to do. Having good and bad coaches throughout my playing career helped me realize what makes a good coach. My good coaches taught me what works well, and my not-so-good coaches taught me what doesn't. 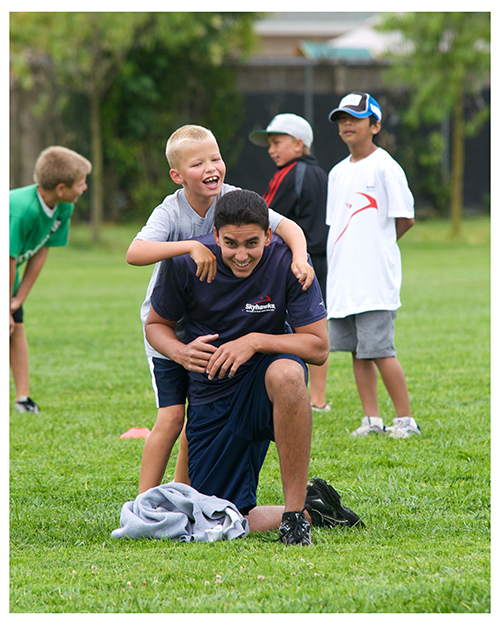 In addition to my basketball coaching knowledge, my love for working with kids had ignited in me a desire to coach. There’s just something about being able to pass along my love for sports and make a positive impact on a young athlete’s life that makes me excited to get up every morning and go to Skyhawks camps. 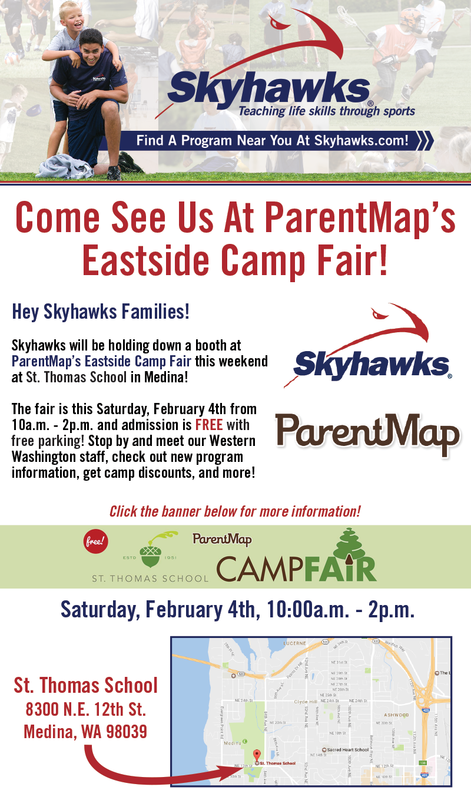 I had worked as a volunteer sports camp counselor near home before, but that doesn't come close to comparing to how Skyhawks operates. Skyhawks is a very unique summer camp organization. In my opinion, Skyhawks’ best attribute is their ability to give each and every child individual attention. When I volunteered previously, I saw some kids being left behind in certain games or activities. For example, one time I noticed a child struggling to shoot the basketball, and I knew exactly how to fix the problem, but because of the unfavorable child-to-counselor ratio, I wasn't able to take time to give him individual coaching. As a Skyhawks coach, this is never a problem. When something like this happens, there is always at least one coach available to teach the child how to properly shoot the basketball. And let me tell you, the feeling you get when a camper takes your advice, makes a shot, and his/her face lights up with excitement, is absolutely priceless. As a junior in college, I could have taken a lot of different routes this summer. I could have chosen a full-time paid internship. I could have chosen to work at a restaurant and make tons of spending money off of tips. I could have chosen to take summer classes. Instead, I chose to come back as a Skyhawks coach. What better way to make money than to do what you love every single day? I come home on Fridays knowing I made a difference in some child’s life that week. I come home feeling good about how I was able to pass along my love for sports to the next generation of athletes. At the end of the day, I come home on Fridays glad to be a Skyhawks coach. This article was written by Skyhawks Franchise Owner Brett Gardner and is cross-posted from Redwood City Parks, Recreation & Community Sevices blog. Click Here To View The Original Aricle. Much has been written over the past several years about specializing in one sport vs. letting kids play as many sportsas possible. There is all this literature that benchmarks what age kids should be when they specialize. I come down firmly in the camp of NEVER. Unless your child is an elite gymnast or dancer, there is no argument to be made for specializing in a sport. Ask professional athletes how many of them “specialized” in the sport they now play. I’d hazard a guess that the answer is none. But, sports have gotten really out of hand thanks to the business model behind competitive sports. Coaches are hired to develop players for college sports programs. That’s what they are paid to do. I hear parents talking about this even with a team of eight-year-olds! If you are reading this and you have teenagers, I hope you’re nodding your head in agreement. Parents of younger children, read on. Sports is not a career for your child. It’s an activity and it should be one of many. But, more importantly, not all kids like sports. As the parent of two very athletic children and the owner of a company that runs sports camps, I should be shouting from rooftops about the benefits of sports. But, I have also seen what happens when kids are pushed too hard. I am a big believer in the “try everything” model of parenting. You never know what’s going to stick. When my kids were little, we tried it all — from ball sports to gymnastics to theater to martial arts to dance. Some of it stuck and much of it didn’t. The questions we asked our kids were, “was it fun?” and “did you learn anything worthwhile?” Next, we asked them if they wanted to do that activity again. With child number one, the answer was invariably, yes. With the other one, it was almost always, NO! Different kids, different interests. Even though child number one seemed to like everything and child number two seemed to hate most things, I still think the try everything model was good for both of them. 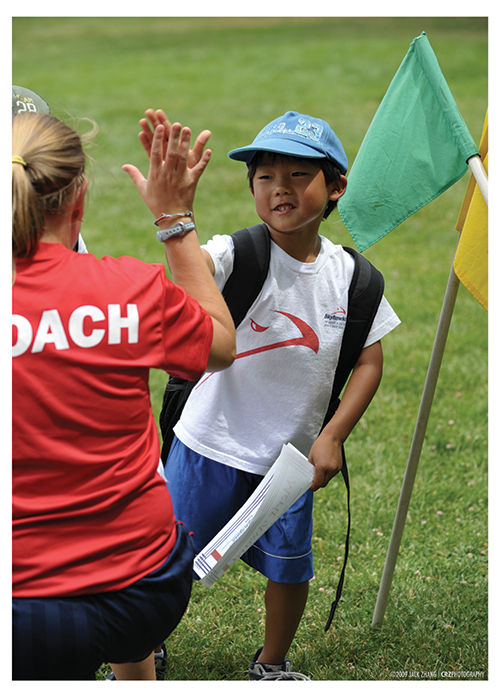 With limited time during the school year, we often used summer camps to let our kids try different activities. Many families didn’t understand why we would do this. If my daughter was “an athlete,” why weren’t we sending her only to sports camps? She plays ball sports nine months out of the year. Does she really need more sports at age eight? We thought it was far more important for her to experience different things. So we encouraged her to try science camps, cooking lessons, etc. She loved some of them and was less enthusiastic about others. But, she got to try something new, which was the most important thing. As summer is looming, think about things your kids have never done before. It could be a new sport, like flag football. Or, it could be dance or robotics. Try everything. You just never know what will stick! We LONG for our kids to sail on that theoretical boat, but not without a waterproof navigation system, a helmet, and a GPS tracker. You see, two essential goals of modern parenting are fundamentally juxtaposed. For us to be successful parents, we must help our children create their own enlightened, strong, successful personalities; to take risks and learn to fail with grace. BUT! We also want to keep them from social and physical harm. And from the point that buckle them into their first tiny five-point restraint car seat, we sincerely believe we can. However, even though (USA Today) an estimated 1.35 million kids are injured playing sports each year, only about 164,000 of them suffer a concussion. 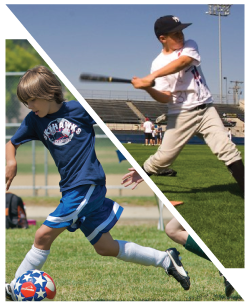 Considering 35 million children play organized sports each year, just .005% of young athletes are injuring their heads. So which of these two seemingly opposing trends do we trust? If you accept the research findings of author and “Free-Range Parenting” advocate Lenore Skenazy, it’s the scariest one. “Parents in the past 20-25 years indulge in ‘extravagant worry’…inflating remote possibilities into looming threats that we think we have to watch out for,” she writes. The current safety device under debate is an impact sensor in children’s football helmets. While the NFL so far isn’t willing to test them, a handful of high school and recreational sports programs are piloting the sensors, which adhere inside the helmets and communicate via handheld device with athletic trainers on the sideline (you know parents will figure out a way to hijack the signal onto their own phones). The devices cost between $75-$125.00, and sensors light up when an athlete takes a hit to the head at 80G or more. The player checks in with the coach or trainer before being put back in the game. As I read more about helmet sensors, most articles pointed to a conspiracy by powerhouse manufacturer Riddell to keep the monopoly on helmets. But, hey, this is a blog, not a Dateline NBC episode, so I’m just wrapping this up. Grown-ups ruin playing. We get involved, and we put our adult-influenced, liability-focused rationale and need for control rationale all over young athletes who are trying to belong and have fun. Give it back to the kids. Let them sail away from the safe harbor. It’s cool if you want to still be able to see the boat, but trust them to get out there.